I heard about it a month ago - that the monthly Art Mart, Laman Seni, at the National Art Gallery will be postponed indefinitely. Attempts to get answers have not been successful. However, the first Saturday of October proved the rumours right - the event is no longer held at the compound of the National Art Gallery. The closure of this art event is a sad thing - especially for artists who had participated in the year-old monthly mart. From my observation, it was also a gathering for artists and for intending collectors to browse for new talents. But the greatest benefit must have gone to the National Art Gallery for I am sure, the total traffic garnered through all the past Laman Senis, would have been more that what the centre would have attracted since it moved to Persiaran Titiwangsa from its earlier abode opposite the KL Railway Station. But this must also be said: That the organisation of Laman Seni, unsupervised, would have become yet another pasar malam or a flea market at best. In the last few installments, one could see that the number of knick-knack traders (those selling anything from sandals to shawls) have overtaken that of artists. Although the definition of art is subjective, I think the organisers should have limited the common, flea-mart traders' participation. They would have drawn crowd, no doubt, but allowing the proliferation of such trading trend would have reduced the status of an art mart to that of a flea market. Another aspect is the promotion of the monthly event. Except for banners lining the roads to the venue, the monthly mart is not much known about. Publicity came by word of mouth and the fact that the venue is 'out-of-the-way' also did little to help promote it. Perhaps the organisers have shelved it for a post-mortem, to see how this event can be improved. If this is the case, then it is all well and good for art and the artists colony. 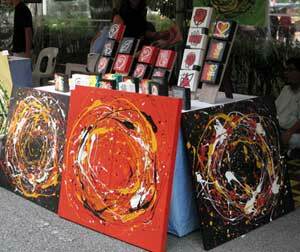 Then the monthly art mart can be brought back and made successful this time. The city is not without arts lovers, otherwise the Laman seni would not have survived so long. Top - Oil paintings being offered at Laman seni. Bottom - Need sandals? Check them out at Laman Seni.